Our class has enjoyed completing the Owl Prowl online activities, reading many owl stories, and using various web sites to learn about this unique bird. We wrote short plays, letters, research reports, and four kinds of poetry. As we learned how owls are able to see at nighttime, we were amazed to discover that our own pupils changed their size allowing more light to enter our eyes when the classroom lights were turned off! After completing the Internet online activity, our class was excited to see a real "mystery rock" discovered by Shelby County naturalist, Darby Sanders. Everyone immediately knew he was holding an owl pellet in the plastic container. The surprise was to discover it contained part of a rabbits skeleton instead of the anticipated mouses skeleton. The two main owls located in our area are screech owls and great horned owls. 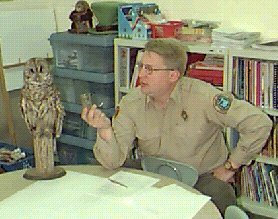 The model shown is a screech owl. We were surprised to discover that the great horned owl is a predator of the smaller screech owl! and usually does NOT build a nest. its head can turn 270 degrees! and flies in feet first. it usually attacks at night. and can live on every continent except Antarctica. its ears are under its eyes! and is helpful because it keeps down the rodent population. it will attack people only if you bother it. Mother: Wake up! Wake up! The eggs are hatching! Owlet #1: Where am I? Where am I? Mother: Were in North America. Owlet #2: Who are you? Who are you? Father: We are your parents. Owlet #2: Cool! One of my back toes can pivot forward. Mother: Its time to eat, Owlets. Owlet #1: Good! I am hungry. Mother: Wake up, Owlets! Its time for breakfast. Owlet #1: What do we eat for breakfast? Owlet #2: How do we get the mice? Father: I will swoop down and get the mice. Owlet #2: How do we eat the mice? Mother: Father will get the mice. Father: Mother will break it up and give it to you. Owlet #1: Okay! Lets eat. M-m-m-m-m-m-m! Owlet #1: Whats for dinner? Owlet #2: Why do we eat rabbits? Father: We dont eat only rabbits. Owlet #2: What else do we eat? Mother: Mice, snakes, blackbirds, rats, and lizards. Okay? Father: Yes. We eat all of those things and sometimes insects. Owlet #1: Wow! We sure eat a lot of things!